Here's an airport, with some planes on the various runways/taxiways and some using the terminal ..
Airport/terminal design is really tricky. There are many spatial problems which are unsolved, resulting in the incredibly inconvenient (for humans/planes) current airport paradigm. Has an "over" terminal ever been contemplated? So, the (whole) airport terminal building is simply up on stilts. Airliners never again need to reverse. They just land, drive around anywhere they want, stop under the terminal. Passengers get on and off. The airliner drives off again, drives to a runway (perhaps again passing under the terminal - no issue) and flies off. No craft would ever reverse. This would be a complete paradigm shift, slashing handling times, costs, personnel, machinery. From the human crowd movement viewpoint, the need for the hell of "separate terminals" is slashed or even eliminated. At worst you'd just have two or three "ranks" of these (rather like giant rows of car parking in a parking lot). 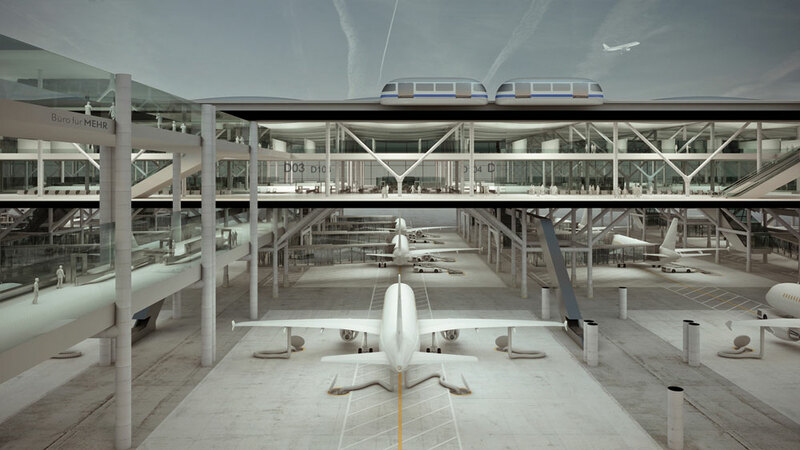 Again this would spectacularly slash the size and infrastructure costs of airport concept design. Often the whole concept of ridiculous people movers, monorails etc would be eliminated or slashed. On that: looking ahead, it's possible there could finally be a drive to your actual gate concept (if check-in / baggage handling / border functions could be rationalized), which would be an total paradigm shift in air travel. Ideally the supporting piers would be infrequent, allowing for totally free and easy movement of airliners, but even if the columns were between each "bay" the major paradigm shifts are achieved. This airport paradigm would seem to be staggeringly more efficient than the current paradigm. No reversing ever! Free driving anywhere for all craft over the entire area. Wasted space slashed. Has this ever been contemplated? Yes. An architect named Miklos Deri seems to have contemplated something similar: Drive Through Airport – Inversion of Procedures. 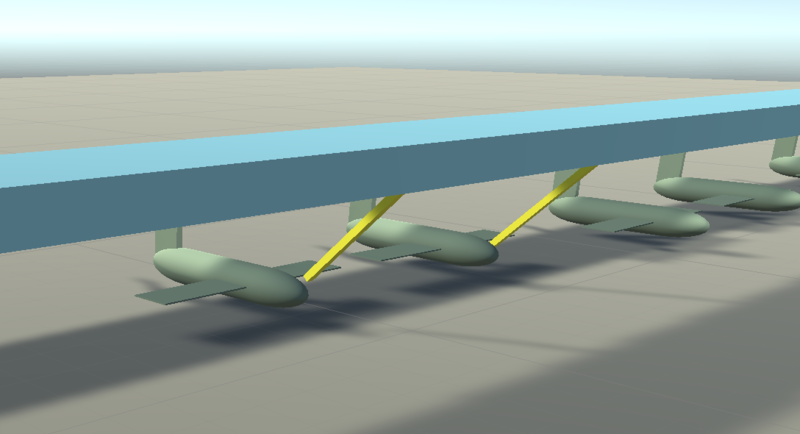 The design is based around smaller aircraft (which reduces some of the height and size problems) and stacks aircraft together in lines to address the space efficiency issues. Nobody has built such an airport (it's a concept, not created for any particular project), and there are practical problems associated with moving aircraft multiple times during a turnaround. Though I've never heard of a terminal design which allows the airplanes to pass under the passenger areas, the same problem could be solved by having the airplanes pass over the passenger area. There exist several underground airports in the world, most notably the Denver International Airport. Though all civilian pedestrian traffic in Denver is routed above ground just like any other airport, it seems that the underground networks could serve the same purpose without many major structures above-ground. This idea could be extended into an airport with a design with advantages similar to that in the OP question, but much easier and cheaper to build and maintain. There are several parts to your "design" that may have been implemented, though not exactly in the same way you have them in your post. Building terminal structures with planes passing underneath them: one example is the bridge linking Gatwick's North Terminal to Pier 6. It allows very large planes to taxi underneath, so it is very, very high, which makes it very, very impractical (you have to go up and down very very long escalators), especially considering many passenger carry hand luggage, etc. Note that instead of having one access from the overhead/underground structure to each plane, there are usually satellites / peers that will allow access to several planes at once. Depending on the actual layout and other parameters, passengers are carried between the building using moving walkways (CDG T1 and GVA in the examples above) or an automated people mover (LHR T5 and HKG in the examples above). Depending on the airport design, you may have to go down and up very long escalators as well, but given how frequent that design is over the bridge design, it must have advantages (more future-proof, larger capacity...). Then there is the issue of having planes that can depart from the gate withough needing a push back. They are parked more or less parallel to the satellite, and once the jetway has been moved, they can just taxi forward. You can see the first two examples above (Geneva and CDG T1) apply this concept. It is not necessary very space-efficient, and is not as extreme as the design in your post, but it is definitely in use (and has been for decades). Similar elements in airport design have been considered, but not this exact design. 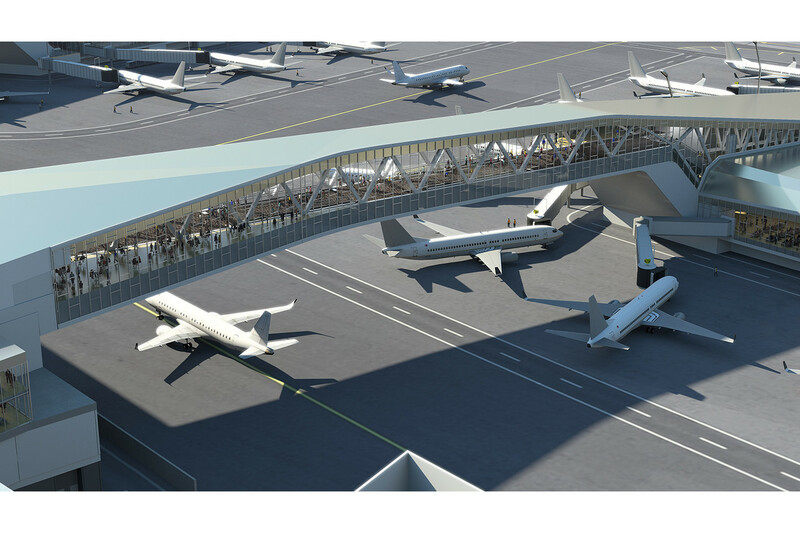 This is a rendering of a real-life plan for a renovated LaGuardia terminal. As you can see, it's not a single wide strip. 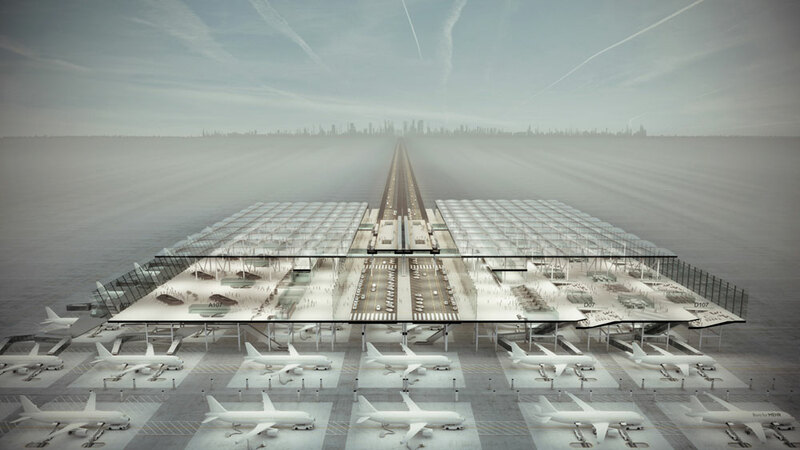 Space is expensive and the design in the question results in an extremely wide airport. 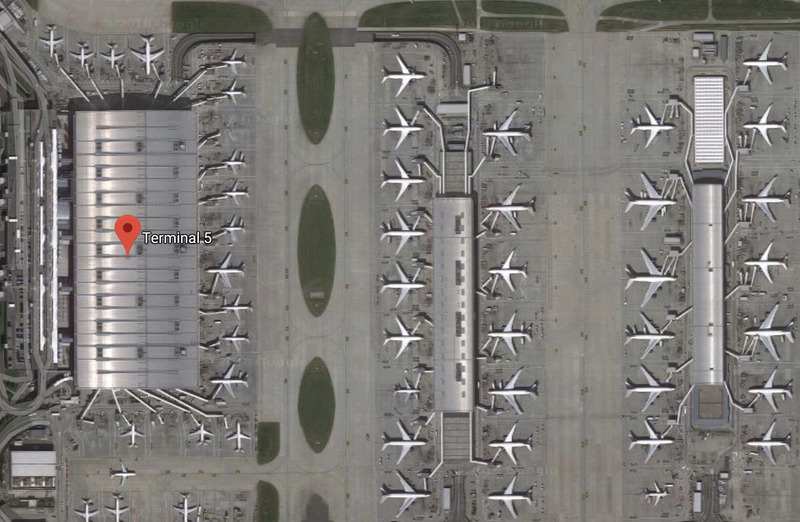 The picture above, if you align the planes with the taxiway/runway, achieves the same effect more space-efficiently. 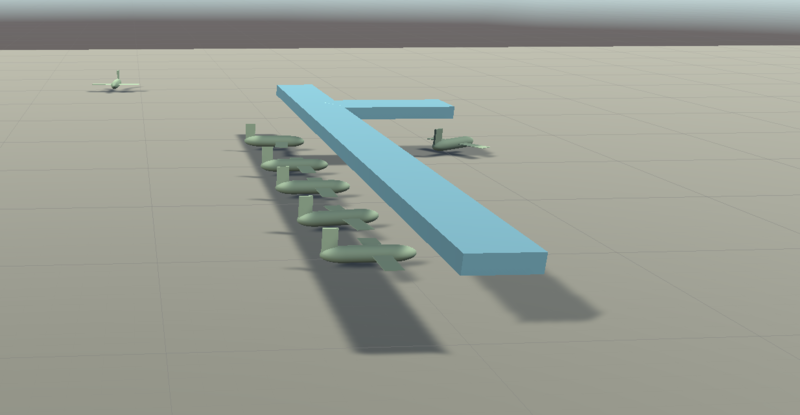 You can load up several planes standing behind one another, there's no need to build everything up in width. 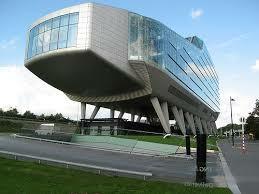 It's actually not trivial to make large civil structures elevated. The examples in your pictures look impressive precisely because it's not trivial. Supporting spans long enough to fit large airliners, with clearances, takes some effort. Realistically, an airport terminal like what you're proposing would have to use bridge construction methods, with the deck replaced by the terminal. Whether bridges are easier to build than tunnels, as used in Denver, varies by site, but it's fairly realistic. Aviation is a cost-sensitive business; there's also a lot more to an airport than the passengers see that you'd have to accommodate. 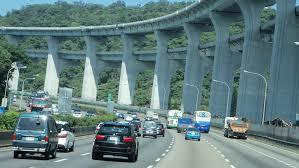 Bridge or tunnel style construction costs considerably more than flat boxes, so it won't become the new normal. But in well-off cities willing to spring for the airport's construction, it can be done. The main benefit you propose for the elevated terminal is that planes wouldn't have to push back from a gate, but planes pushing back really isn't a big enough problem that you'd want to build these massive amounts of infrastructure to solve it. 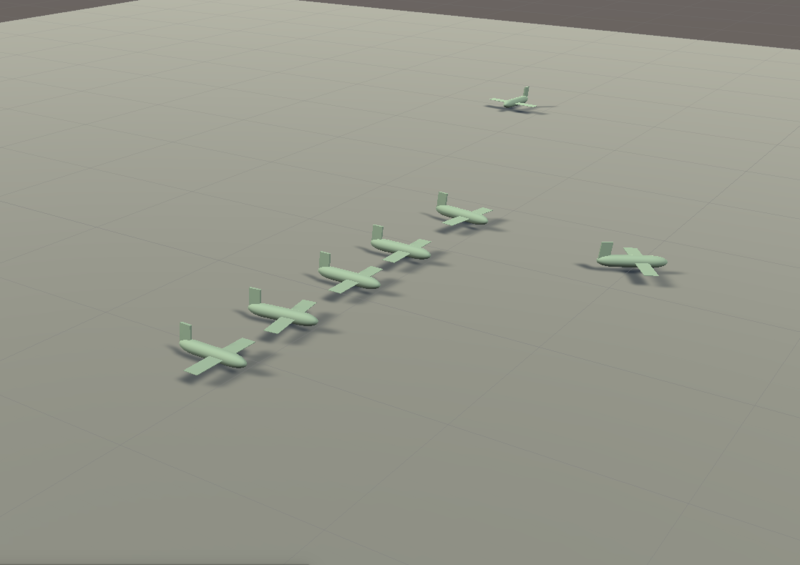 Returning to the original "air field" approach of having a large area where planes can move in whatever direction is most appropriate doesn't seem workable. Other answers have pointed out that ATC would become very difficult. Planes would no longer be constrained to taxiways and runways so how would you even have the conversation where a pilot says they'd like to take off, please, and the controllers direct them which way to go? In addition, you'd need to pave a truly enormous amount of land to airport runway strength, which would be phenomenally expensive. And the airport would need to be twice as long to allow planes to land, go to the terminal and take off again without turning round. Even more expensive. It's not clear how the "straight through" concept would work with varying wind directions. 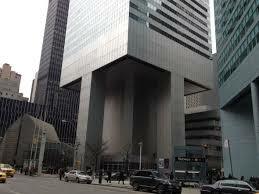 What if wind conditions today mean that planes want to take off at right-angles to the terminal building? Also, even at airports where all the runways point in the same direction, it's not uncommon to change the direction of operation as the wind changes. 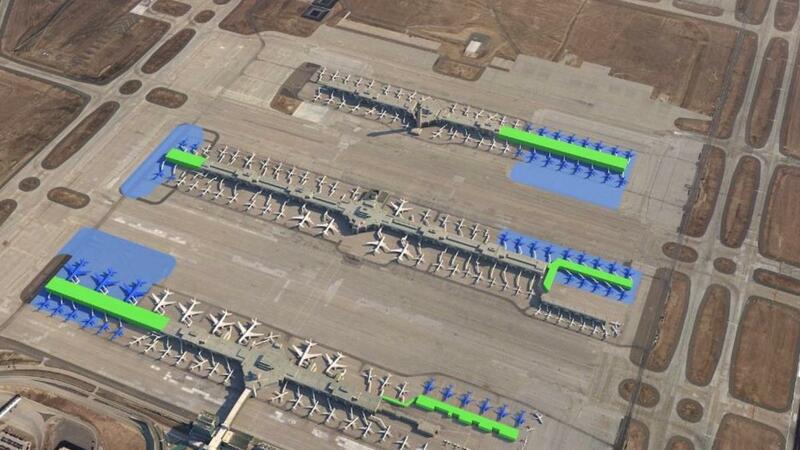 With a "straight-through" airport, you'd have a bunch of planes pointing in the wrong direction. The "drive to the gate" concept isn't actually new so we already know it doesn't work. Kansas City International Airport (MCI) was built that way in the early 1970s. Unfortunately, that was just before airport security screening became a thing. "Drive to the gate" fundamentally requires separate security screening at every gate, or shared between small groups of gates, which is extremely inefficient. As soon as you try to share security between larger groups of gates, you lose the "drive to gate" concept because (a) the security area is used by many people, so there's not enough parking space nearby; (b) it's shared between a lot of gates, so there's not enough space for all those gates to be nearby; so you end up driving to somewhere quite far from security which is, itself, quite far from the gate. Basically, you're back to the traditional airport design. When MCI was built, TWA insisted on the "drive to gate" format, it was found to be awful within a couple of years, TWA insisted that the airport be rebuilt, the city said "Sorry, dudes, but we just spent an absolute fortune building this thing to your design; we can't afford to do it all again" and TWA said, "Screw you, we're moving to St Louis." You can land or take off anywhere, and get to and from, any gate. This would create a nightmare for anyone planning arrivals and departures, and is sure to result in utter chaos (not to mention crashing planes). However, as some has noted parts of this concept has been used. Overhanging gates, walkways, terminals and so on. What you have described in your suggestion is basically (to my understanding) piers as used on airports today, although with a different shape than we are currently used to. (...) the need for the hell of "separate terminals" is slashed or even eliminated. At worst you'd just have two or three "ranks" of these (rather like giant rows of car parking in a parking lot). These are piers. An airport holds a lot of people during peak hours. Not everyone is on their way to an aircraft ready to board, not everyone is collecting their luggage and driving off. 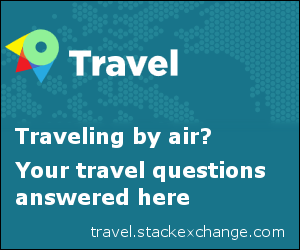 A lot of people are early, transiting between flights, delayed or there for other reasons. Having a large terminal helps with the crowding, as the people can be spread out over a larger area. Piers can then be built with a smaller capacity in mind, as you keep the number of shops and dining areas to a minimum to avoid attracting people who have to wait for whatever reason. Again, this would be chaotic. Passengers need to know where the plane will arrive. The ground controllers has to know so they can coordinate the planes movement with any other plane on the ground, ground services (food, fuel, cleaning) needs to plan how much to deliver and where, plus the fact that different aircraft require different infrastructure on the ground. An A380 carries more people than an E-170. Allowing the pilots to just select a gate might result in an A380 arriving only to find that their gates are occupied by smaller aircraft. If they are at all able to get into a smaller gate and unload, the areas around that gate might not have room for the embarking and disembarking passengers, leading to congestion and delays. There are many factors in play when designing an airport. Cost and complexity are two, but regardless of how efficient you might create the airport you are still faced with the fact that you need to schedule movements. People will always be dumb, slow, confused and unfamiliar with your airport and airplanes will always be delayed or suffer breakdowns, and your facilities need to account for this. Your concept might work if everything else was working perfectly/to schedule, but I fear that once a disruption occur it would propagate and gradually cause more and more problems. Amsterdam's Schiphol Airport sort of uses this property, but the planes don't end up underneath the terminal. Rather, the ground underneath the terminal is used for vehicle traffic and whatnot. When you get off the plane, you get picked up by a bus and brought to an area where there is an escalator/elevator to bring you up to the terminal level. I reckon airports don't want to use your design because a chunk of building material could cause expensive damage to an aircraft, even if the chunk was the size of a grape.